If you have the opportunity to start a business with family members—or join an existing family-owned business—then you need to think long and hard about that decision. Deciding whether or not it's smart to start a business with family members, including a spouse, is not as crystal-clear as your affection for the people who make up your family. And as in many families, disagreements arise even among experts on whether it’s wise for family members to start and operate a business together. Two distinguished experts on the topic maintain polar opposite positions on starting a business with family. Joachim Schwass, director of the Global Family Business Center at Lausanne-based International Institute for Management Development (IMD), cited numerous studies that show family-controlled and quoted companies create more wealth and outperform public corporations on many metrics including total returns and cash flow. In addition to that, he concluded that family-owned businesses have a greater incentive when it comes to prudent management, given the common aspiration to pass on a healthy business to the next generation. In contrast, John Van Reenen, a unit director at the London School of Economics, believes family-controlled corporations seriously lack meritocracy in that the choice of chief executives and key leaders usually is limited to family members. Moreover, this arrangement lowers the drive of next-generation leaders to excel, tending instead to slacken off given the certainty of gaining a profitable position within the company. As a result, many family-controlled companies trend downward over time in terms of growth and innovation. But the downside is equally convincing. 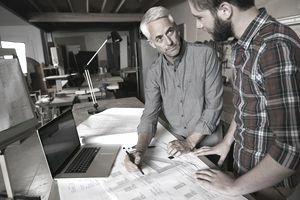 As reported in the Harvard Business Review, 70 percent of family-owned businesses fail or get acquired before the second generation takes the helm. When making your own decision about whether or not to start a business with family members, consider some of the pros and cons. You’re in the zone when it comes to internal relationships and collaboration. You've spent plenty of time with your family, you know and understand their interaction style, and you're less likely to be caught off guard by unforeseen character flaws that could spell disaster for a company. Key people also are stakeholders in more than just the success of the business. They're united by a common goal and likely willing to make great sacrifices for the success of the company. The mood in the workplace is more relaxing because you’re comfortable with people around you, and there's no need for small talk. Because all of the family members know each other well, there typically is less pressure when it comes to financial performance and more flexibility on time needed to realize returns on your investment. It’s easier to get the ball rolling if you’re launching a company fast because you won't have to bother with interviewing potential partners, checking backgrounds, or following up on the certifications and qualifications you've been told. Things can become too comfortable, which tends to slow down the growth of the business, in the long run, reduce the drive for excellence, and undermine professionalism in the workplace. Unfair business practices, such as having a little-to-no system of meritocracy in place, tends to emerge in family-owned businesses where the succession of the company is all but guaranteed to the next family member in line. This can deter talented candidates and employees who otherwise would be motivated to excel and move up within the organization. Moreover, unqualified or ill-equipped family members can become leaders, which results in mediocre business performance. Leaders may encounter a reluctance in making important decisions that negatively impact a family member. If a family member who's an employee or partner isn't pulling his weight or isn't delivering on promises made, it'll be a tough conversation when it comes down to addressing a potential change in position for that person.